Shetland, a subarctic archipelago of Scotland, with its sometimes azure but mostly darkened skies, choppy yet stunning seas and interesting wildlife is slowly becoming a tourist favourite. The Islands’ almost 1,700 miles of stunning and complex coastline prompted Lonely Planet to call them one of the best places to visit. Moreover, Shetland’s noir style setting has spawned several famous works of cinematic art like Michael Powell’s classic The Edge of the World (1937), Simon King’s documentary series Shetland Diaries (2010), and more recently, the hit series Shetland starring Douglas Henshall. 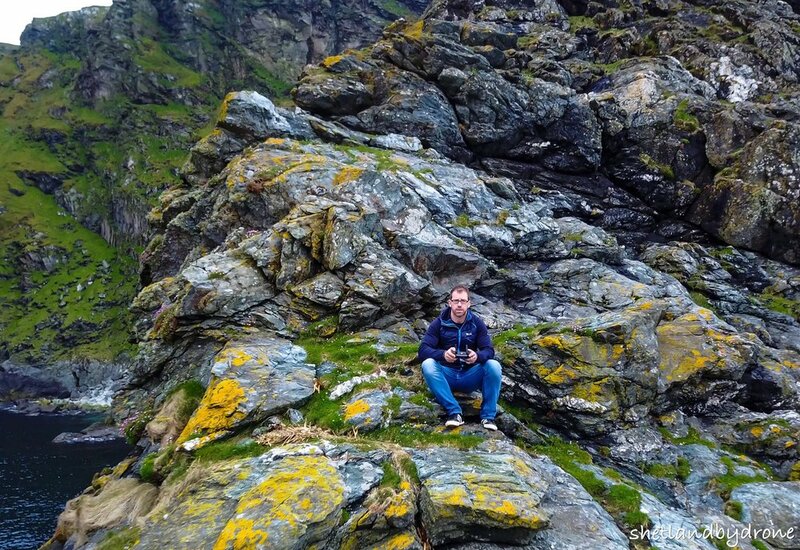 In short, living in Shetland is a life-long adventure; just ask Andrew Simpson. Simpson is one of the lucky few to call these Islands home, and has been in love with the archipelago for as long as he can remember. 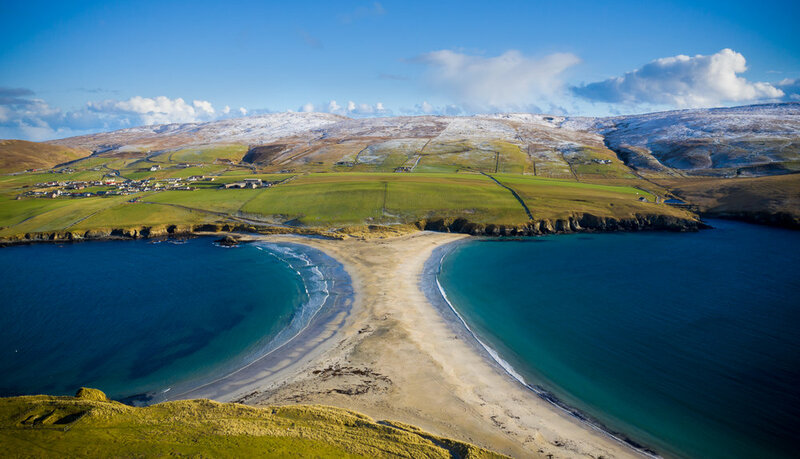 As a token of this love, the 43-year-old documents the Island’s beautiful locales with his drone camera and shares it with the world through his popular Instagram page, Shetland By Drone. In conversation with TAL, Simpson whose hobbies also include walking long distances and playing football, speaks about his initiation into drone photography, wearing the amateur photographer tag with pride, and his enduring love for the Islands. What’s Shetland By Drone all about, and what prompted you to start it? Were you a drone/conventional photography enthusiast as a kid? Initially, I had a personal Instagram account where I would share the typical family and friends-related posts. Slowly, I started posting pictures of Shetland’s natural attractions - the ones I saw daily around me, and those started getting a lot of attention. Their popularity encouraged me to explore other natural wonders that Shetland has to offer. But I wanted to do so in a different way. Lerwick - The Horses Head. I wanted to have a bird's view of the stark blue seas, crashing waves, and natural rock formations. And, that’s when I decided to start drone photography and opened a separate Instagram account to share the beautiful images from my home town with the world. When I was growing up, drone photography was unheard of! My interest in it piqued only in the last five years, and since then I have been trying to improve my photography skills. I enjoy reading photography magazines and come across numerous pictures taken by camera drones. The images captured by professional photographers of breathtaking landscapes from across the world astonished me! And, I was itching to give drone photography a shot myself. What was the first drone you used and what was the experience like? Which is your favourite place to take pictures of? I first started using my drone - the Mavic Pro on a warm Sunday morning in May 2017, clicking pictures at this beautiful, little secluded beach called Maywick in the South of Shetland. Almost two years later the images I captured that day continue to be some of my best works and have also been featured in a number of publications in Shetland. I have a few favourite places that I frequently haunt, for pictures; Uyea with its incredible scenery, being one of them. 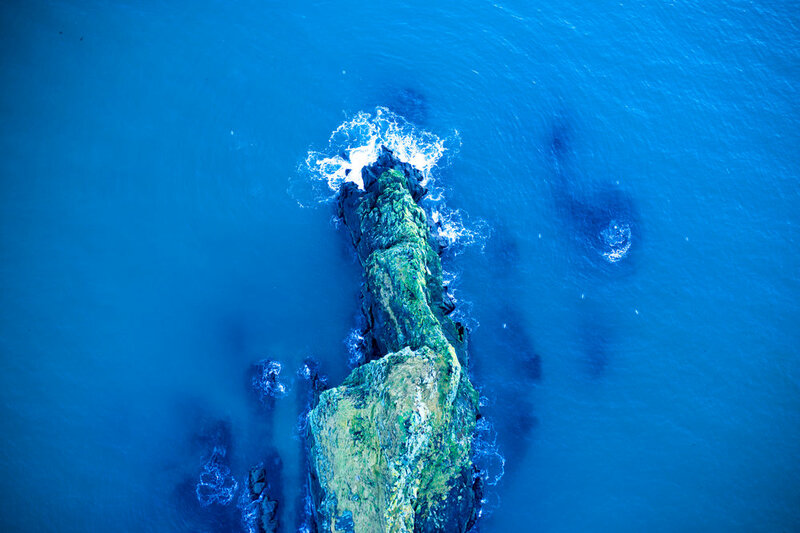 Another favourite is St. Ninians Isle, where you can get a great picture any time of the year. Are you a professional photographer? What is your favourite type of photography – landscape or any other genre? When it comes to photography, I am an absolute novice. And, to be honest, I’d rather keep it like that. I love photos taken by professional photographers; their finesses, colour saturation, sharp editing, etc. But, sometimes, an amateur photograph manages to capture the real essence of a subject – raw and uncensored. I enjoy those photos a lot. Therefore, being an amateur photographer helps me take pictures freely without being bogged down by the need to be technically accurate. Landscape photography is my favourite genre, and I feel there’s no better place than Shetland to practice it. How did you learn drone photography – self-taught using tutorials or professionally educated? And, what kind of drone and camera do you use? Keeping abreast with contemporary innovations and immersing myself in new experiences keep me motivated in life, and drone photography was no different! I kept hearing and seeing camera drones, and drone photography in magazines and other forms of media, and soon I became consumed by the idea of it. I gleaned a lot of information from online tutorials and YouTube videos, and read user-manuals obsessively to get the basics of drone photography right. I started with a DJI Phantom 3, but it was tedious to assimilate and operate, and - I am embarrassed to admit - tired of its cumbersome mechanisms, I sold it three months later without even trying it out once. Later, I purchased a DJI Mavic Pro which was extremely user-friendly, and I became fixated with the machine. When the superior version, the Mavic Pro 2 came out six months later, I bought it in a heartbeat. How did you deal with the legal aspects of drone photography; taking care not to shoot in prohibited areas like Defence and other sensitive zones? Luckily for us amateur drone photographers, all the information on safety and regulations is available online. It is advisable to have a look at those before attempting to fly the drones. I also have a Public Liability Insurance for my drone. I keep within the boundaries of drone flying and use a common-sense approach. In Shetland, one can fly a drone anywhere as we have only two main airports and a third smaller one. There is quite a bit of helicopter traffic to and from the isles. But, at the end of the day, while flying your drone, if you hear an aircraft hovering nearby, get your drone to the ground, and wait till the aircraft has moved on. I steer clear of No Flying Zones like Sumburgh, the South end of the island that houses our main airport. There are a lot of gorgeous scenic places around the airport, but it is imperative to remember that safety and adherence to rules come first. I also have the Air Traffic Control number on my phone, and although the airport shuts at 7.30pm, I call ahead to ensure it is alright to fly my drone during after-hours. What kind of challenges do you face while taking pictures using drones in Shetland and how do you overcome them? ﻿In Shetland, the weather is always the biggest challenge! Sometimes we have four seasons in a day, and sometimes it is sunny one minute, windy and raining the other. Flying your drone through the stormy and unpredictable weather and hoping that the battery lasts till the drone gets back to you can be quite challenging. But with practice, I have become more confident and am able to manoeuvre the drone back, with some per cent of battery remaining, at the hint of any upcoming inclement weather conditions. Also flying the drone a few hundred metres above the sea can sometimes be nerve-racking. Drones are expensive, and if they fall into the sea, you are poorer by a few thousand pounds! Who has been your inspiration/role model when it comes to photography (drone or otherwise) and why? ﻿There are so many brilliant drone photographers from all over the world on social media these days, and their work is incredible. Some of my favourites include Marvin Kuhr, Janni Laakso, Jack Anstey, Frederik Schindler, Asa Steinars, Cleo Joosen and Jim Picot. Do you think there’s enough awareness and information about drone photography in Shetland and Scotland? 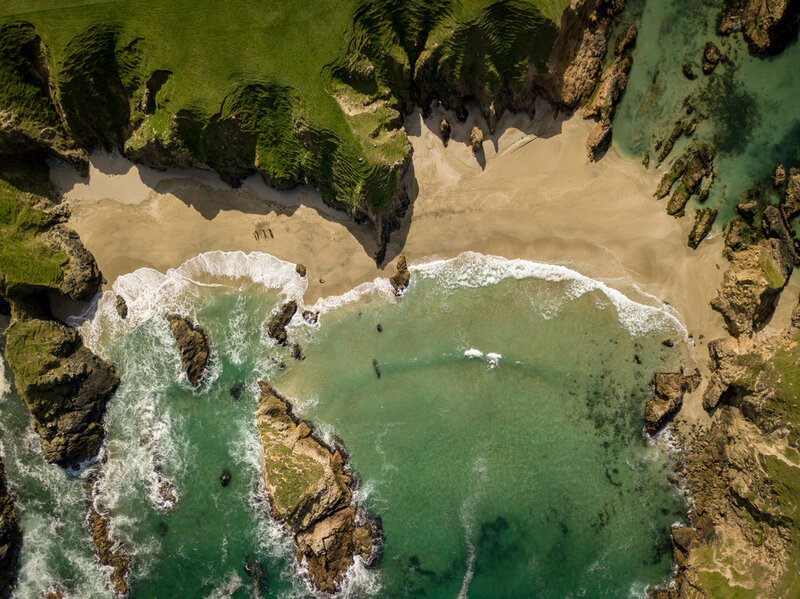 Shetland and Scotland are incredible places for any type of photography – especially drone photography. Both the sites have breathtaking scenery and have many hidden gems that can be explored without bothering anyone. There are many 'droners' in Shetland, so information and awareness about camera drones and this type of photography are quite high. After almost two years of taking pictures of Shetland's stunning locales, what has the reception been like? ﻿The reception has been extremely encouraging! I get compliments and messages from old timers who are now living elsewhere or from those who have families in Shetland, saying that a particular image brought back fond memories for them. They appreciate the ability to see certain places they know from angles they wouldn’t or couldn’t have. What advice would you give to up and coming drone enthusiasts? And, what are your future plans with regards to droning? Anyone can purchase and fly a drone as long as they follow the relevant guidelines and procedures that are now being enforced by the government. Also, depending on the kind of photos you want to take, there’s a wealth of information on the internet; just get Googling! Droning is a hobby for me, and I'll be keeping it that way. I'm heading to Maloy, Norway next summer, and will be taking my drone with me to try and shoot something different. I'd absolutely love to go to Lofoten in the North of Norway. I have seen some images other photographers have taken of that region, and it looks spectacular! Hopefully, my drone photography can do justice to the beauty of the place. Follow Andrew’s Adventures on Instagram.